I love the time of day when dusk envelops the world under the heavy forest canopy, but away from the trees the sky is still bright evening. I tried to capture that feeling in this painting titled “Evening”. The edge of the meadow in the upper part of the Curry Preserve is a perfect place to experience this magical time. The forest shade eases the beings who live there toward settling in for the night. Paintings don’t always work on the first try. As you’ve seen in other articles in this blog, I sometimes practice a painting by doing a smaller study before doing a large painting. It takes some thought to work out color and value problems that can arise. On the other hand, sometimes a painting doesn’t work but I can’t put my finger on the specific reason. In those cases, I put the painting aside for awhile so I can come back to it with fresh eyes. I originally started this painting several years ago. I was not at all happy with the foreground, so I put the painting away in a drawer. Today I resurrected it and immediately saw some things I could do to improve it. I added color variations in the foreground. I made a few strokes to suggest branches and shrubs, and removed a large branch in the upper right corner. I’m much happier with this version! Filed under Blog. 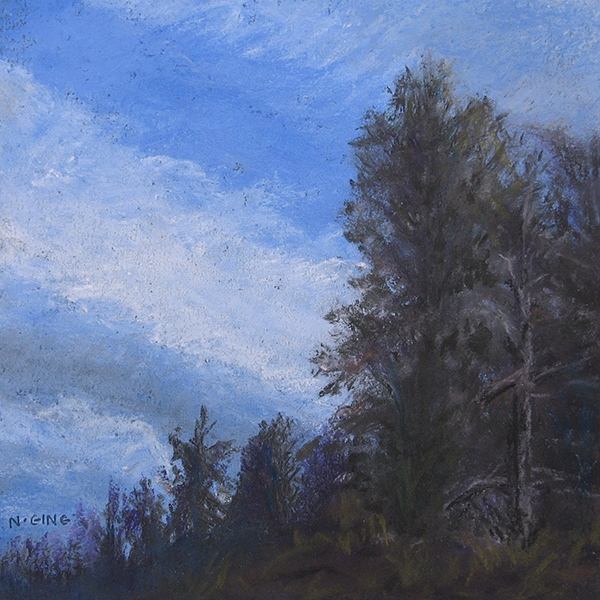 Tagged 6x6, landscapes, Nancy Ging, painting process, pastel paintings, skies, small wonders, soft pastels.